This text tells the story of a very complete visit of a person to the Eiffel Tower, by a slightly rainy evening of October 2015. The works of 2011 on the first floor were finished, the installations were all recent, which gives even more interest in this story. This same story is told in the form of images, here: See the story in pictures. 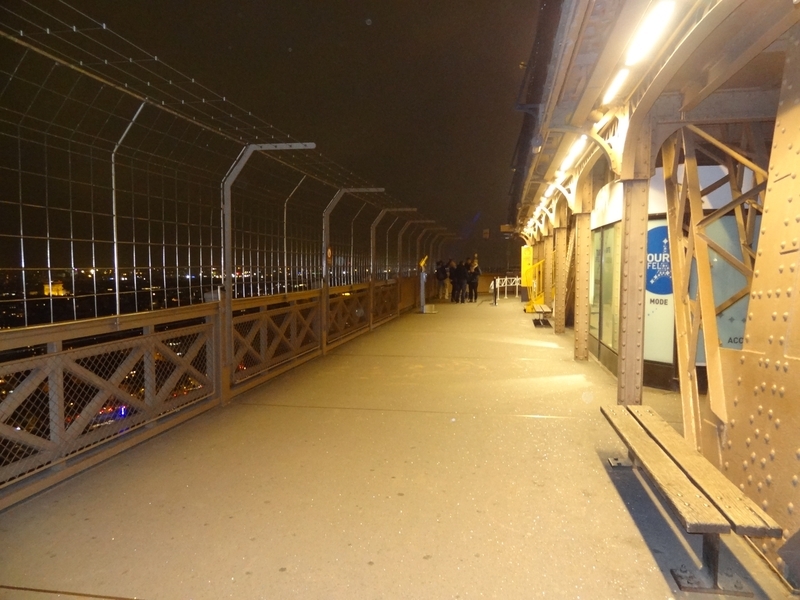 It was in October that I had the opportunity, for the third time in my life, to climb the Eiffel Tower. This time, I was alone, and I was able to go there quite late, around 17:30. Next time, I will have to memorize where the other exit is, the one I will take back tonight, at the foot of the steps of the Palais de Chaillot. 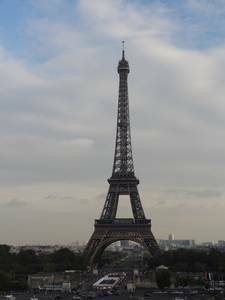 I still arrive on the slab Trocadero, the silhouette of the tower is discovered in my view. There are not many people on the slab, some sellers on the sly who calls me - and I do not know, knowing full well that there is nothing legal in there - and I go on the balcony, near the side steps. A good thirty tourists are taking pictures, most armed with these long metal rods at the end of which is their laptop. It must surely make pretty selfies. I take one or two photos myself and resume my journey, down the large steps, then the pedestrian walkway, along the giant fountain, and I cross the bridge. The gray sky is clear enough to see the details of the tower, which is already drawing. I even distinguish movements on the platform of the 3rd floor. Two brand new lamborhinis are available to me: Their owners offer to rent them by the minute. An ice cream seller seems to be bored stiff, while the vendor of waffles and crepes does not stop, he was wiser, given the cold weather. Reasonable cold, but cold anyway. Besides I have a T-shirt under my jacket and a cheich, but I have not put it yet: I hope I will not have to go down because of the cold ... I'll have to be put on a sweater, finally. On these thoughts the pedestrian fire goes green, the few tourists who accompany me cross the avenue and are challenged by the many sellers on the run, especially those with children. I go my way and finally arrive at the feet of the Eiffel Tower. And the word is well chosen, seen from here the 4 feet of the tower are impressive. They are both aerial because of joists interwoven, but also massive, because of their stocky shape. "The tour starts from the ground floor, when we walk under the structure"
"Do you know how much is it for the lift?" I then go to the East pillar and ask the guard in charge of bag checks if it is the queue reserved for Internet purchases and groups. He smiles at me saying no, not at all, it's a normal entrance for the elevator. When I point out that the queue is much shorter than the other pillar, he shrugs, smiles again and tells me that it's like that, it'll surely rebalance. 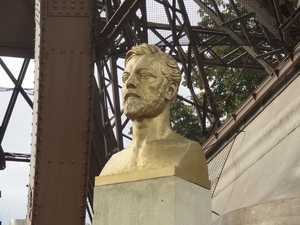 This mechanism was designed by Gustave Eiffel, it is still in place today, although the cabins have been redone. Note that another stairway down to access to the machines, prohibited. 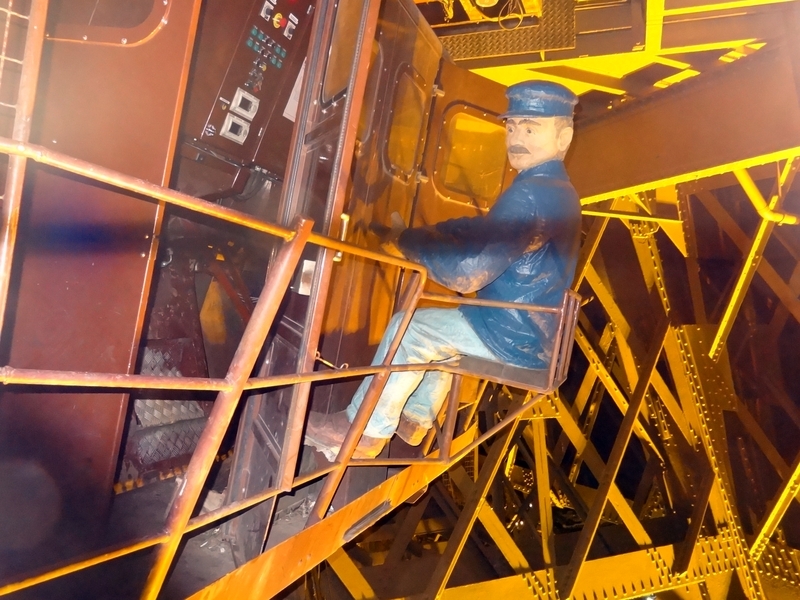 A large decorative panel says "Historic Machinery 1899", and below is actually a machine, not impressive, but maybe because the metal structure is really a lot, then, by comparison, this machine seems small. 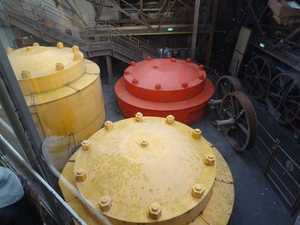 Through the windows have seen huge metal tanks, two yellow, one red, laid on the ground, in the technical area. But they are really huge, all bolted. When the elevator goes down, I see that the two yellows move: They go up! I remember that the water tanks used by Gustave Eiffel to power its hydraulic motors have been converted for two of them in counterweight lifts, which they were already at the time. The system is really impressive, and I will have the opportunity, at the exit, to see that the West pillar has the same mechanism. Once completely out the tanks measure well 5m high, for about as much diameter, that is to say the weight that there must be in there! When the cabin has arrived at its destination the doors open, we are about twenty to enter it. The liftier, in this case a liftière, presses two or three buttons, the doors close and I see that the ceiling is partially glazed, which allows me to see the climb vertically, but it is well horizontally that it is the most interesting. The cabin, while climbing, crosses all the spacers and the edges of the metallic boxes, which gives a point of reference when one looks at the horizon. Quickly the horizon appears, the roof of the buildings are smaller and smaller, the cabin seems to accelerate. If the climb had seemed slow from below, in the elevator it seems much faster, in a few seconds we stopped on the first floor. The Lifiere announces that we do not go down to the first floor, we will do it during the descent of the 2nd. 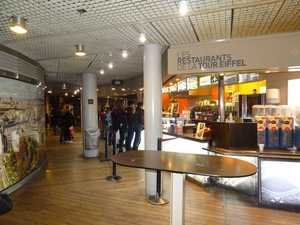 She states in English and French that the first floor contains a museum, shops and a temporary exhibition. A few seconds pass, the cabin rises again, at the same pace. Tourists who are with me are amazed at the height, which is not abominable, it's true that it starts to be impressive. Arrival on the 2nd floor: The lifter wishes us a good evening, but in English only, which makes me smile. Just out of the cabin a guard asks us to queue for the 3rd floor, it starts right out of the cabin. OK, I have to, but there I am a little more worried, the tail seems long, it winds on the platform until it sinks to the center in a small building, with a staircase on which I see people waiting . The cold wins me nicely, so I cover myself with the cheich and follow the flow. Finally, I am 1/2 hour later at the doors of elevators rising to the top. There are 4 spread on the right and left of a small corridor, two yellow and two red. The wait was not long, and I was able to see that the metal plates on the ground, those on which I walk, are worn! It's crazy how the repetition of steps can wear metal! In the queue I also saw the bulbs that serve to flicker the tower. Honestly, it's pretty ugly, seen up close. They are green translucent boxes in the shape of diamond, screwed on iron plates themselves screwed on the beams and beams of the tower. Knowing that there are 20,000, I imagine the work to install everything. You can see them looking up from the balcony. There are really a lot, spaced about 1 meter, sometimes with two boxes side by side. 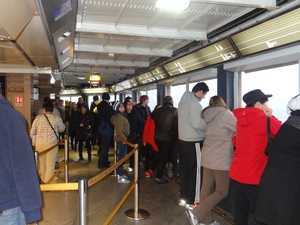 I enter one of the 4 lifts for the summit at the same time as a good twenty tourists, in a merry hustle and bustle. The lift announces the climb. On the way, a passenger asks him for the altitude, then starts the conversation about his job, there is a good minute of travel. He answers that it's a decent job, it depends on the passengers ... I'm dying to ask him if there are ups and downs, but I'm not sure to be the first to tell him So, I keep the joke. Still, during the trip the view is superb. Paris spreads at our feet, we see the city through the windows, and that despite the fact that we are crowded. What's odd is the succession of metal beams that we cross regularly, every 2 seconds or so, it's a stromboscopic effect. The arrival is fast, the doors open on a room not very big. We sometimes see the famous personalities, sometimes the engineers who built the tower, sometimes the workers, etc. A small text accompanies the photos. This piece in which I am does not present much interest, once the turn has been done, there is little that the elevators. By cons, two stairs go upstairs above, the 2nd level. I know in advance that this is the outdoor balcony, and that I confirm when I see the tourists coming down, frozen, and feeling the drafts in the face. I decide, despite my T-Shirt under my jacket. The gallery is more interesting than the central room, it is full tour of course, but offers a better view of the Paris region, beyond the city. The Invalides are immuminated, we can see the triumphal arch, the view is to the detail of the Defense. It's impressive, but not as much as I thought. Finally, my memory of the view from the 2nd floor is just as beautiful, I'll probably confirm it later. On the other hand I approach the edge and there, the emptiness frightens me squarely: 300m of emptiness, in line with the balcony! I look up because I need a few seconds of adaptation, it's really a funny feeling, this vacuum. The big fence in front of us is reassuring, I do not dare to imagine the first visitors of the tower, in 1889, when they had to go up by a spiral staircase equipped with a simple ramp and that the balcony did not have protection other than the handrail, 1m high. "The cold is less intense than I thought, but the wind is unpleasant"
The cold is less intense than I thought, but the wind is unpleasant. I imagine there too what tourists should feel when they come here in high winds ... No wonder the summit is closed that day ... I walk quietly, along with a good forty other people. Some have a glass of champagne by hand, in glasses with feet, but in disposable plastic. 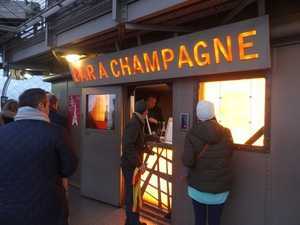 Yes, there is a champagne bar here. And we find it quickly, it's actually a tiny room with a counter at the wall, so we can not get in, there's just the server behind, and it does not have a lot of place with him. Just boxes of champagne, bottles and more bottles! Besides, it serves a lot of people, despite the cold, there are always people here. Here, the sign is illuminated: Here it is, the tower begins to light up, it is too dark. I continue my tour of the balcony and locate a model of the summit as it was at the time of construction, including its amazing color: Dark red. It is reminiscent of the original color of the tower, but of that color, nothing remains of it today. It is clear that there was before a portico that supported the flagpole. It was quite successful, like architecture, by the way. It motivates me to look up. Above me I have tons of television equipment, radio, antennas no longer to finish, various machines of which I do not see the interest, lamps, and even one of the headlights that is used to scan the Parisian sky. Well, it will not be long before it starts. All these devices are connected to a room above, this is sometimes called the 4th floor. It is above, but it is forbidden to go there, of course. Too bad, we will just see from below the huge television antenna stands at the top. It is equipped with a series of white diffusers that make him a big nose ... At least it is the idea that I am made of it, seen from here. 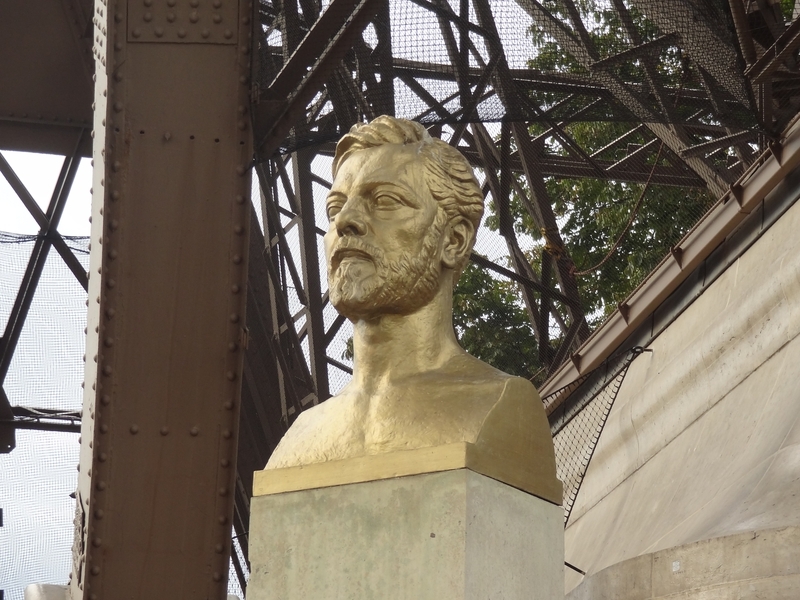 I resume my walk and falls on other curiosities, the main is the office of Gustave Eiffel. It is a small room, now in the shape of a triangle but formerly larger and rectangular, and furnished as it was at the time of construction. This office had been built for him, he could receive personalities. There are three models in the office, they represent Gustave Eiffel, his daughter Claire, and Thomas Edison. This meeting actually took place on September 10, 1889, very shortly after the inauguration of the tower. Edison was an American industrialist who looked a lot like Eiffel in the idea they had of the industry at the end of the 19th century. He had brought back from the United States an object that was innovative for the time, from his imagination and recently commercialized: The phonograph. That's why there's a phonograph on the console, in the office. This office is welcome in the visit, it shows something more original than the eternal informative panels that are posted everywhere. Too bad we can not get inside, it is visible through three glass windows. A little further on there is a metal plaque reminding us that this is where the first radio link in history was made, and below, a sign shows the progress of science in the field during the past years. There are a few more people there, so I'm on my way. 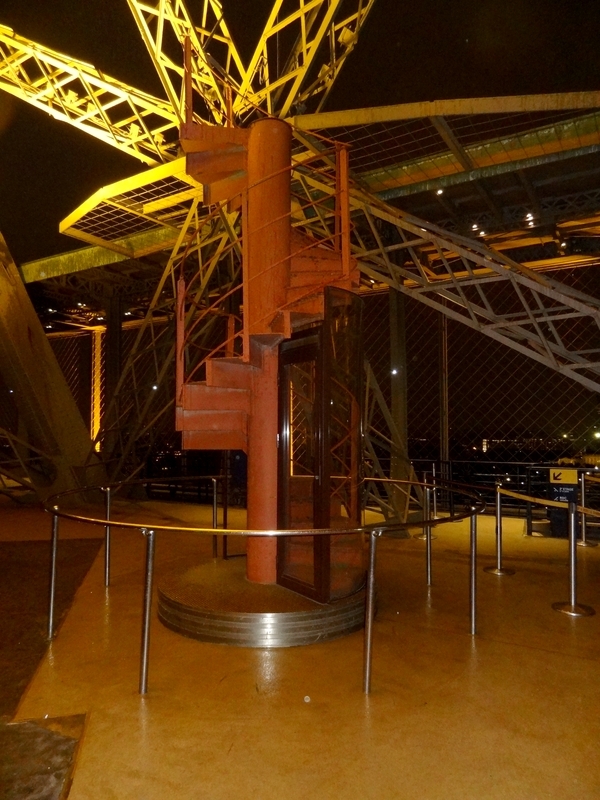 A little further, between the champagne drinkers, I see a small reproduction of the installation of the giant manometer that was set up at the beginning of the century, then, later, a plaque commemorating the establishment of the tricolor flag on 25 August 1944 while Paris was still busy. 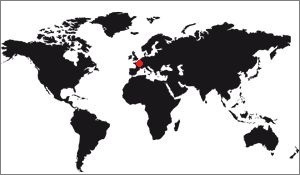 It contains the names of the four people who made this feat. Behind this panel I fall back on the champagne bar. The time for me to see that there are two stairs and see the amazing multi-point lightning rods that punctuates the flanks of the 3rd floor and I go back to the warm level. I redo a tour of the room, enjoying the view in a twilight more and stronger, and I decided to take the elevator down. This time, it's almost empty. A minute later, I'm back on the 2nd floor, almost at my starting point, because the elevator doors open on the other side for the exit. As I descend, I arrive on a sort of platform beaten by the wind - light. Around me everyone scatters quickly, I prefer to take my time. To my left, the souvenir shop, opposite the stairs down to the 1st level, and to my right the balconies. 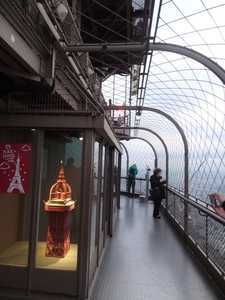 These are all around the 2nd level, and from here we see, not only the breathtaking view of Paris of course, but below the balcony of the 1st level, this floor containing 2. Looking up we see also the top of the tower, and even distinguish the intermediate floor, the famous floor that was used to tranship passengers before the installation of the modern elevator. The lights are now on, but the tower is not flickering yet. Soon 20h, she will not delay. I go around the balconies, admiring the view. The night is fast approaching, not to mention that she is already there, it is Paris by night that I see. The Pantheon, the Invalides, the triumphal arch, which seems so close, it's all Paris that I have at my feet. Moreover, they are well stocked, even at the end of the day. There are few people, it's nice to walk quietly, without being jostled. The central shop is round, it forms a kind of big pole in the center. 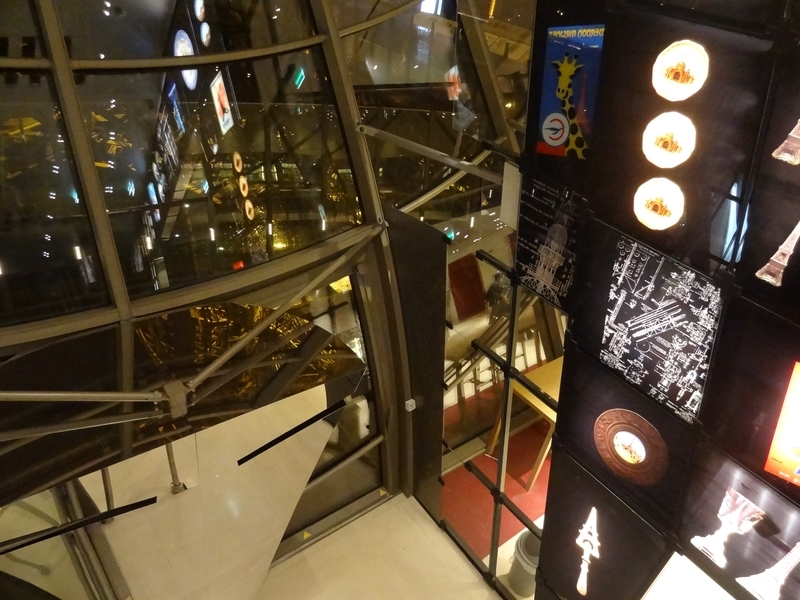 It is decorated around a huge photograph of the view from the 2nd floor. It's fun to recognize the outside view with this model, taken in close-up. There is also a sandwitcherie, which can even be called a small cafetière, a mailbox, machines to buy the silver coin 'Eiffel Tower', and a strange kiosk with macaroons. There is even a bar with macaroons. I'm getting close to it but it's closed. Other compositions are proposed, it looks delicious all that ... But strongly that the premises are improved, it will give even more desire. More to do here once the tour is done. I prefer to discover the first floor which I know has been the subject of important work. Suddenly, I hear a distant clamor, powerful voices scream. 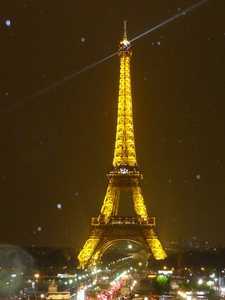 I need a few seconds to see that the Eiffel Tower has just triggered its flicker, it is 8h battery. The clamor, it comes from tourists downstairs who marvel at the spectacle. It must be said that I have already had the opportunity to see him several times, it is true that he is damn beautiful. But I did not expect to wait for shouts so high, I'm still over 120m altitude! So I look at the flickering leaning from the upper balcony, we see the top of the tower. But with this angle of view, not only is it uncomfortable, but it hurts the eyes, the first light bulbs being just above me. I give up, and I prefer to keep my nose up, but in the metallic structure of the tower. 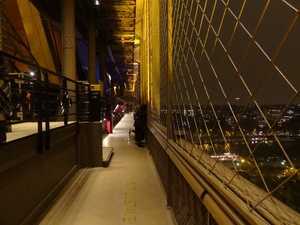 The advantage of the Eiffel Tower compared to the Tower Bridge in London, for example, is that the structure is not hidden by walls, a roof, or whatever else. We can see the caissons, which I remember. A box is a kind of rhomboidal parallelepiped, whose angles are joined by spacers. 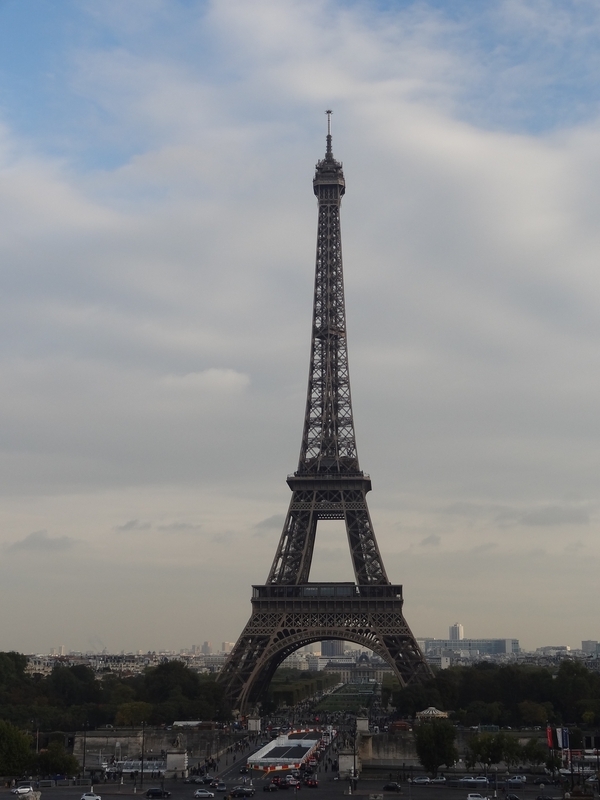 The Eiffel Tower is only a stack of 30 boxes, smaller and smaller. Moreover there are only 5 to go upstairs. When we know this, we immediately identify, in the entanglement of metal bars, the spacers of the main beams. The yellow light is quite bright, by far, the tower is not so yellow. Well, enough time spent nose up. I find the stairs going down to the first floor. Yes, by the stairs, it's more fun. I take advantage of this stop to find that the steps are numbered 10 in 10, something that I had never noticed during the previous climbs. To stretch my legs I accelerate a blow, and without noticing it I find myself on the first floor: Finally, these stairs are not that long when we go down. The first floor is quite different from the rest of the tower. Done in 2011 it is very modern, and in my opinion, very successful. The key word was "Epure". This is how we must see, this floor is clear. A large esplanade, glass barriers not to stop the view, and buildings inside very large but do not seem to take much room upstairs. Maybe because this floor is much bigger than we thought, it was very crowded. Now empty, it is much more pleasant to visit. The problem is when it's raining, which of course happens to me. I see above all that there is only one level here, unlike the other floors. I am on a very large square extruded in its center, the hole being protected by large angled windows. I imagine there are a lot of people who are having fun sticking to the window, facing the void, it must be impressive. Being alone, at night, and under a more intense, I do not have fun with that now. On the other hand, I notice that on the ground there are 8 glass floors: four at each corner and four at the center of the sides. That, I can go there. It is not very big, but we can see the ground, about 50m lower. Despite the low light I do not stay long on it, it's still something. Rectangular in shape, they have rounded corners and front facades are large windows that hide nothing from the inside, except the pavilion 58 °, whose dim light from the inside darkens the view. 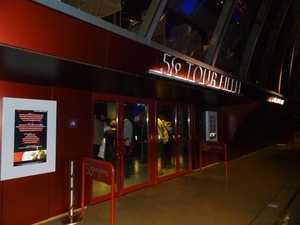 The Eiffel Pavilion has been rented, it hosts a small private concert, the blue interior light is quite violent. Once past each pavilion I notice on the ground a pink circle in which it is written "Place to kiss", which means "Place to kiss". It's original, but it's mostly a place to make a nice selfy. So I go to the galleries. They are behind the pavilions, they walk along the outside of the first floor and offer the view of Paris, by night for me. 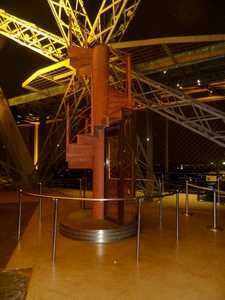 To get there you have to go down a few steps, a relic of the original design of the tower. Indeed, formerly the gallery was lined with a second internal gallery, between the first gallery and buildings that occupied the entire 1st floor. This second gallery was high compared to the first so that the players can enjoy the view, too, without being bothered by those of the first gallery. There was even a running hand, which bordered it, but running which was replaced by a railing. I then go slowly around the 4 galleries. 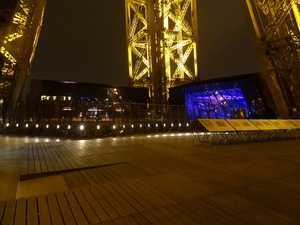 The view is superb, at night. Closer to the lighted buildings of Paris than the 2nd or 3rd floor, I must be more used to the height also, and suddenly I feel better to take advantage of this view. A thin and wide fence prevents me from leaning into the void - or worse, to jump - it distorts the monument a little but it was put in place a long time ago, I got used to it. The general decor has not changed too much, the tower is faithful to itself from the beginning. I mean that despite the renovation of the floor, the architecture of the galleries is consistent with what we imagine. On the ground, each angle is marked by the direction, so we have 4 inscriptions taking up the 4 cardinal points, and always on the ground each gallery has a name indicated. The one I am on is "The Street of Arts and Sciences". There are benches, regularly, and spotting scopes of the same style as those on the floors. One of the galleries surprises me, it contains a series of desks telling the story of the tower, its construction. 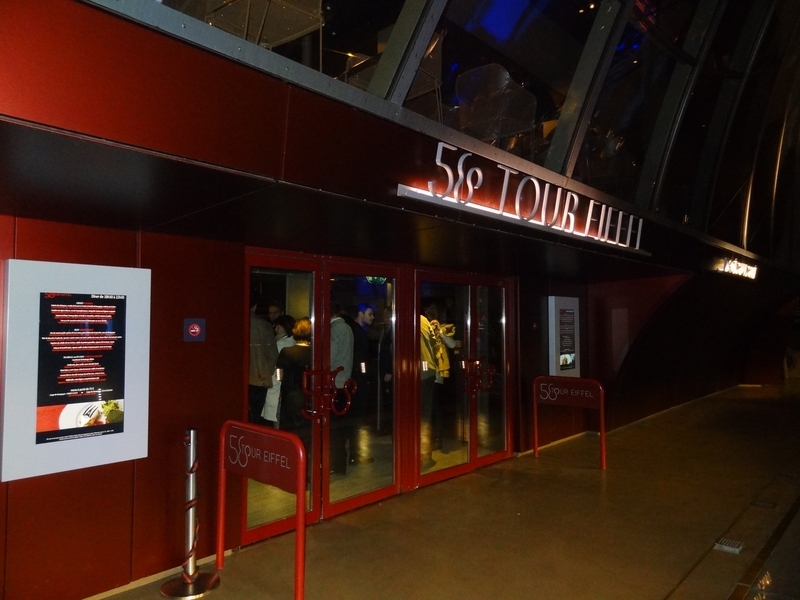 There is also a desk on the comparison between different monuments of the World, and another on the Eiffel Tower in the cinema, with beautiful posters of films. The desks are pretty well done, both in their styles and on the content. There are some screens showing videos, and interactive kiosks. Going back I will now be interested in the different elements presented on the esplanade, when I arrived I saw them from afar only. First there is a strange plastic bubble, about 2m in diameter. As I approach, I see that it contains a machine that looks like a pump, with several outputs. It has an electric motor and a drive wheel quite important. The sign announces that it is the Edoux pump. I know it was the one used to pump the water up to the jacks in the elevator cabin on the 3rd floor. This system, which seems rather ingenious, allowed to mount an elevator car at 80m high, which brought visitors to the intermediate platform, which was used for transhipment of passengers. From there, a similar system climbed 80m more to reach the top of the tower, on the 3rd floor. This pump was therefore quite powerful, and it worked from the construction of the tower to 1983, when this elevation system was replaced by today's elevators! One of these portions has been preserved, it is now exposed in open air, in the original color of the tower, a dark red rather surprising for us who are accustomed to its brown color. The staircase is protected by a sort of door, which prevents visitors from climbing on it. Very near there is a kiosk with three large enough screens forming a sort of small, shallow cinema hall. The facade of the same red as the pavilions announce "The Tower of Mr Eiffel". The screens project a video repeating the different stages of the construction. The film is not very long, we can take a few minutes to watch it, especially since it contains quite interesting scenes. It is however vaguely redundant with the desks of the galleries. Still a little further there is another very similar kiosk, it is entitled "The World Expo". This time it is not a screen but two windows superimposed showing sets rising and falling successively, some only half, so that over time we see the decorating Paris at the end of the nineteenth century change, over the World Expo. We see the Eiffel Tower appear, different pavilions, etc. The show should be appreciated by the youngest, when at least young, they can have fun to understand the different decorations, which is not necessarily easy because we see, for example, the old palace of Chaillot which few people are able to recognize it, having been demolished a long time ago. I will now go inside the Ferrié pavilion, where there is a shop. I go on one of the glass floors near the windows and I took the opportunity to look on the ground. 50m down there are still a lot of tourists stroll. The sellers of objects on the street brought out bright objects, this year the fashion is for those who launch into the sky, so there are some flying light objects that come to me, without reaching the first floor, of course. The good thing about this area is that there is always someone here, you never feel alone. There are essentially sandwiches, it's snack-type snacks. At the end of the corridor, the other window, which serves as a wall, at the bottom, allows to have a view of the gallery, and beyond Paris at night. It's quite strange to see Paris like that, through a window, while it's raining outside. But I'm not at the end of my surprises about it: Indeed a staircase leads to the first floor, an airy floor consisting of several small rooms. The largest is closed, it is the projection room. On the large back wall, white, and on both side walls is projected a film showing images of the tower during its construction, as well as images of the context of the time and the following years. We see Josephine Baker, the lights of Paris, the big shows. The last part of the film is dedicated to illuminations, the opportunity to see not only the glittering tower, but the fireworks that were fired from the monument, as well as some special colors it took for certain occasions: Blue the Europe Day, Red for the Chinese New Year, etc. The film lasts about 15 minutes. I advise you to sit in the center of the room, slightly in front of the back wall. If there are not too many people it allows you to turn your head in all directions and always have something to see. If there are people, you will have to step back a little, otherwise you will obstruct the view of other spectators. Well, by the way, the movie is pretty simple, we do not learn much. It's pretty, but that's it. So I leave the room when it is finished, a logo shows a chronometer that ticks the seconds before the next broadcast: Barely a minute. So, if you get in the middle of the movie, which is probably, wait a few minutes to take it from the beginning, it's a tip. Unless you're within minutes, which would be a shame for you. Surprise: In washing your hands, the view is 60m lower: It seems to fly! Well, I go down again and stop on the walls of the corridor, downstairs. There is an evocation of elements around the Eiffel Tower and Paris during the twentieth century, but the most interesting is the central screen, very large. It is a touch screen that allows you to turn the pages of the book written by Gustave Eiffel himself in 1900 in which he tells how he built his tower, in all the details (This is also the book that has given most of the technical explanations to this website). It may be for enthusiasts or specialists, who will have obtained it by other means, but it is interesting to have made available to the general public. A very good news, then. The Ferrié flag being finished for me, I come out on the platform. Good news, the rain has almost stopped. I head for the next pavilion, 58 °. Once in front, I see that it is almost not lit in, so we do not see what's inside. I can still see that there are at least two levels, a large number of tables almost all occupied. Besides, it shows, there are groups of people coming in, see that there are already a lot of people waiting in, and come out, a little annoyed. Yes, I think it's better to book even during the week. The interior of the pavilion is classic: A large counter, a room, finally, nothing that shocks me. The decor is modern, I like it a lot. 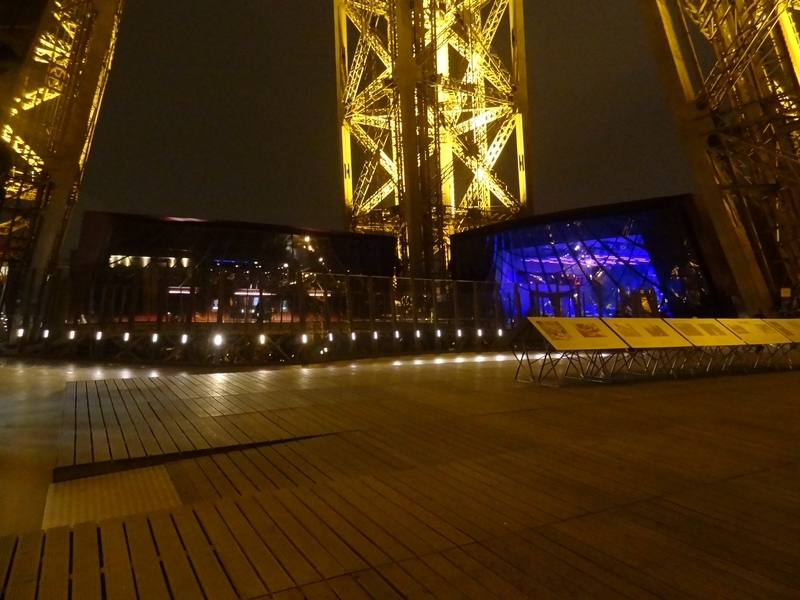 I do not linger and will see the 3rd pavilion, the "Gustave Eiffel". It's a rented lodge, and tonight it's been rented. I see that a small orchestra, probably rock, settles. There is also a buffet being installed, and as it is 20:30, I imagine it will not be long to arrive a few dozen people with the right to enter. I do not have it, so I just look through the huge glass inside the room, which occupies the entire space of the pavilion. The lights are blue, dim, so that we see them from all over the platform, it attracts the eye. But here too I do not have much to do here, so I continue my visit. Having gone around the first floor, I decided, before leaving, to return to the galleries and walk a little on the platform. 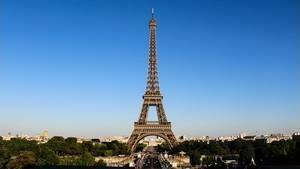 I do not discover anything, except the small room for the purchase of coins coins stamped "Eiffel Tower". 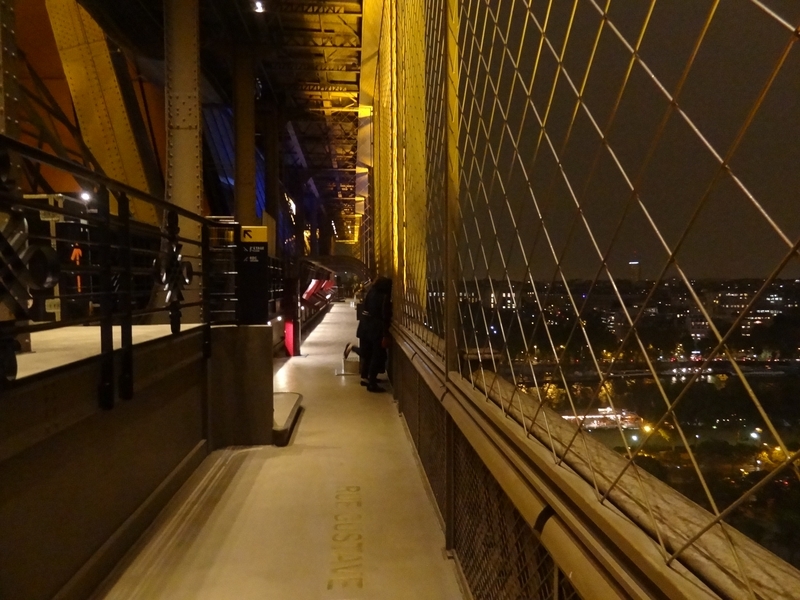 I still enjoy a bit of the view of Paris at night, and head to the West Pillar lift station, just not to go down by the same elevator that allowed me to go up. The lift station is very modern, I had seen earlier, but I confirm that from the inside, it's the same impression as from the outside. No wonder since it is almost only glass, so we see very well inside the outside. The elevator is a little wait, but when it arrives I go up with a small score of visitors who leave the monument, like me. A minute later, we are in the West pillar. As everyone leaves, I find a door leading to the technical installations. Since there is nobody, I go and spend a little time in a corridor whose end is closed by another door, locked that one. The hallway is separated from counterweight tanks by a simple fence, so I can see them up close. There are also some machines, but the most important mechanism is on the floor below, and that I can not go. The visit is organized, but it is necessary to make an appointment and the schedules do not correspond to my possibilities. Too bad, but I know it's something I'd like to see. So I decide to leave definitely, and find myself on the forecourt. I look up and see the same thing as before, but at night. We can see from the ground the wide windows of protection, and the pavilions. The rain starts to fall again, so I go to the Trocadero. 21h stack, the Eiffel Tower starts to flicker. A clamor spreads all around. I take the opportunity to take some pictures, but without delusion, with the rain it will not be very beautiful. I move away as fast as possible along the bridge so as to have it during its illumination from afar, which I manage to do, but I will not have time to have the Trocadero. So I go slowly up the steps of the palace, and take one last picture from afar. It was still a nice visit. 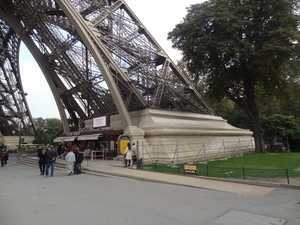 The Eiffel Tower, there is a lot to see and nothing, I stayed 3 good hours. I remember that the visit of Tower Bridge, in London, took me only 1:30, there is much less to see there. The Eiffel Tower is a sacred monument to visit at least once in his life, that's for sure.